Surprise photo in Ron Paul Family Holiday Cookbook — a clue? It is a work of love by Carol Paul and a treasure for those of us who know and love this wonderful man and his family. There is a photo in it that could definitely hold a clue for the future. Subtile I know, but what do you think? I recently got my copy of the Ron Paul Family Holiday Cookbook that I look forward to every year. It is a work of love by Carol Paul and a treasure for those of us who know and love this wonderful man and his family. There is a photo in it that could definitely hold a clue for the future. Subtle I know, but what do you think? Carol PaulFinding Gems (FGST)OKgrassrootsR3publicanRon and Carol PaulRon PaulRon PaulRon Paul Family Holiday CookbookSandra CrosnoeTom and Lori PyeattValorie and Jesse BentonWill Ron Paul run for president in 2012? Previous Previous post: GiN: A Merry Christmas at American Airports? I don’t get it. Is this some sort of puzzle? 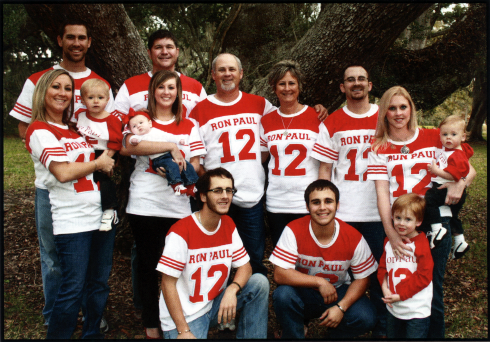 What am I supposed to notice, beyond all the RON PAUL 2012 jerseys? Rich, the picture came out last year before we were sure he would run again and some of us felt like the picture in the annual family cookbook was assurance that the Ron Paul had already decided and the family was giving us all a sneak preview. Hence the post. Doesn’t make much sense now unless you look at the date of the post, but it was good news then!